Next Issue is a dream come true for all of you reading a lot of magazines, and trying to save some money - it’s basically an all-you-can-eat service for the most popular publications starting from $10 a month. But so far, it has only been available on Google’s Android platform and not on the iPad, the most popular tablet out there. 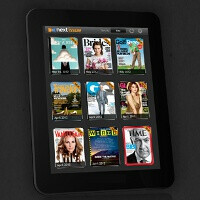 Now, this changes as Next Issue brings its app on the iPad, but only for users in the United States. With nearly 40 magazines like Time, The New Yorker, Wired and many others are all included in the offer, but if that wasn’t enough the company behind it plans to double up its catalog by the end of the year. Now, the $10 fee right now applies to most publications, but if you want the tabloids and some weeklies, that jumps to $15 per month. Weird enough, publishers say that there will be a different selection of apps for Android and iOS. Overall, if you’re reading more than a couple of those magazines, that’s definitely a hard-to-beat deal, isn’t it?